Well I missed National Writing Day on October 22, probably due to a lack of national advertising on the part of its sponsors. Had I known the Senate would pass S.R. 310, I would have put pen to paper that day come Hell or high water (and lately, it's been Hell, but that's another story). Hell notwithstanding, I've signed up for NaNoWriMo again. Yep, I enlisted in the ranks of those who'll write fast and furious starting tomorrow, November 1, aiming for that golden 50,000-word bar. I may not make it this year, but I'll at least try. I've had a contemporary gelling in my head for awhile, clamoring to get out. Last year, I finally wrote the historical novel I had in my head since visiting Key West in 2003. Freya's Bower will release Angels, Sinners and Madmen. I'm currently in first edits, so have no date yet, but likely it will release in early 2010. NaNoWriMo's great for forcing your focus to one story, something I normally struggle to master. A dozen or so stories have been clamoring for attention, but starting tomorrow, a shiny new one will take priority. 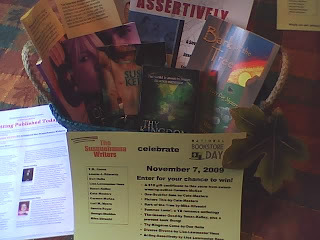 The Midtown Scholar Bookstore will celebrate the first national National Bookstore Day with a giveaway basket of books by central Pennsylvania authors known collectively as The Susquehanna Writers. Central Pennsylvanians named The Midtown Scholar as the region’s top independent bookstore for six years running. The Midtown Scholar Bookstore has hosted author events for several members of The Susquehanna Writers, including Don Helin and Mike Silvestri. Readers can learn more information about The Susquehanna Writers at http://thesusquehannawriters.blogspot.com. No purchase is required to enter the giveaway. To enter, visit the Midtown Scholar Bookstore at 1302 North Third Street (across from Broad Street Market) in Harrisburg. The drawing will take place on Nov. 21. Visit the store online at www.midtownscholar.com. Below is a photo of the basket (pumpkin not included). The Mechanicsburg Mystery Book Shop will celebrate the first national National Bookstore Day with a giveaway basket of books by The Susquehanna Writers. The Mechanicsburg Mystery Book Shop has hosted author events for several members of The Susquehanna Writers, including Don Helin, Dennis Royer and Mike Silvestri. No purchase is required to enter the giveaway. 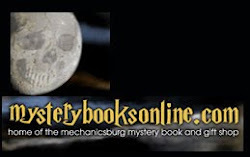 Visit the Mechanicsburg Mystery Book Store at 6 Clouser Road, on the corner of Trindle Road in Mechanicsburg, to enter. The drawing will take place on Nov. 22. Visit the store online at www.mysterybooksonline.com. The writing life is tough. Finding an agent for "Gene Linked," a home for my short stories, and sinking my imagination into my current writing project hasn't been easy. Between preparing lectures for my teaching responsibilities and seeing to my children's needs and emotions, there is little time left at the end of the day. What happened to hobbies? What's to become of the unfinished sweater I'm knitting or the scrapbook of last year's vacation which sits on my workbench undone? Who's been weeding my gardens? Not to mention the many, wonderful books I have yet to read. Life was simple once, before cell phones, organized travel sports, TV clickers, computers ... email. Once upon a time, a long time ago, there was not too much to do--but to write. What do the Bible, Mein Kampf, Harry Potter, Lady Chatterly's Lover, Doctor Zhivago, Grapes of Wrath, and Alice in Wonderland have in common? Well, for starters, they've all become classics. But they also have another common link. At one time or another, someone sought to ban them. Books are often banned for their contents, but how many have been banned for their covers? Seems that’s the problem author Bonnie J. Doerr is facing. 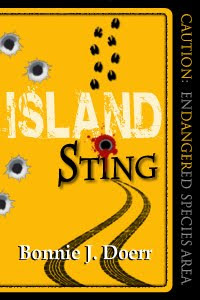 The cover in question is on Island Sting (Leap Books, January 2010). Doerr, a former Science teacher, planned her fast-paced eco-mystery series for classroom use. Each book in the series features a different endangered animal and is accompanied by lesson plans for use across the curriculum. Doerr, who won a NOAA (National Oceanic and Atmospheric Administration) grant for her first book to be used in environmental education, did in-depth, on-location research for each book, and many educators have praised the book’s content. But will her new, edgy cover mean that rather than supplementing the science curriculum, the book will be banned by schools? If some teachers have their way, it will. The teachers’ objections? Bullet holes and blood. Some cited school shootings and violence as a reason for not wanting this book in the classroom. No author wants a reputation for promoting violence. But what if the book in question is about violence? In this case, a poacher is killing the endangered Key deer. The background of the cover is designed to resemble the Caution: Endangered Animal Area signs found in Key West, Florida, the book’s location. The bullet holes suggest the danger as do the swerving tire tracks and fleeing deer tracks. So the cover seems appropriate for the subject matter. And Leap Books queried teens about the cover and found it particularly attracted the interest of teens who indicated that they rarely read. Here's hoping teachers recant and select the book for its content. They might be pleasantly surprised to find reluctant readers snatching up the book. And isn't that every teacher's goal--to get students to read more? On another writing note, a staged reading of my play, "Magnificent Healing," will be presented on October 17 as part of the annual PAIRWN women's health conference. If funding is received, it will be given a full production ready for June at Open Stage of Harrisburg as part of the Flying Solo Festival. Keep your fingers crossed! Today, Shadowfire Press releases Reflections, my short dark fantasy with a Halloween theme. Halloween's my second favorite holiday of the year. Reflections was such a fun story to write, too. A well-written detailed description in a novelty catalog actually sparked the idea for it. Among the pages of Halloween costumes, the photo of a crystal ball caught my interest. Set on a three-legged scrolled pedestal which, according to the description, symbolized "beginning" or "birth." The ball represents the universe and what is to follow. Of course, after reading that, I had to research crystal balls. The practice of scrying, or gazing into crystal balls, dates back to the Druids. The other story components just fell into place from there. Hope you'll check it out! At Lissa’s Halloween party, all hell breaks loose – literally. When Lissa removed the pan of popcorn shrimp from the oven, the tiny forms reminded her of mangled body parts, twisted and mutilated. She scraped the image from her mind as she transferred the shrimp onto a serving platter. Such thoughts had plagued her since Selena had set her grandmother’s old crystal ball on the dining room credenza and hung the matching mirror above it. “Did you remember the cocktail sauce?” Lissa called to her roommate, who was still fussing with her costume in the bathroom. “It’s in the bag on the counter.” Selena’s voice carried across the living room like a disembodied spirit. A chill passed over Lissa. She had to stop this, it was ridiculous. She shook off the chill as she carried the platter to the table, but halted in fear. Out of the corner of her eye, dark shapes moved inside the mirror, escaped its confines, then soared to the ceiling. When she gasped and whirled to face it, the mirror was flat, static. The only image in it was hers. That scared her more than anything. She wasn’t even ready, and people would be showing up soon. Cate Masters’ novels, novellas, short stories and flash fiction appear at epublishers The Wild Rose Press, Eternal Press, Wild Child Publishing/ Freya’s Bower and Shadowfire Press. Her flash and short stories appear at such web zines as Cezanne’s Carrot, The Battered Suitcase, A Long Story Short, Dark Sky Magazine, and The Harrow. Visit her online at www.catemasters.com, www.catemasters.blogspot.com or follow her on Facebook or Twitter.